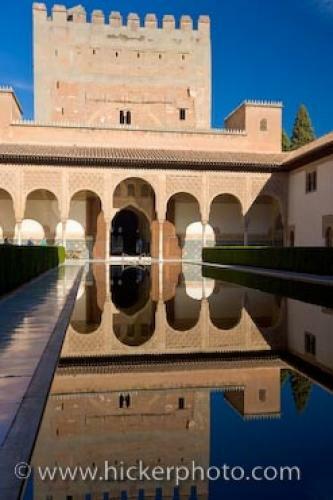 A tour of the Casa Real at the Alhambra brings the visitor to the Court of the Pool which reflects the image of the stunning Moorish architecture on its surface. The royal throne is thought to have been placed in the Salon of the Ambassadors in the Casa Real (Royal House) at the Alhambra, facing the Court of the Pool - through intricately carved archways. The 7 arches of the northern portico extend from columns with stylized capitals of stalactites, while the walls feature poetic inscriptions. Their image reflects in the still mirror like pool - the main feature in the Court of the Myrtles. The Northern portico with the Tower of Comares in the background, at the Court of the Myrtles (Patio de los Arrayanes), aka Court of the Pool (Patio de la Alberca), The Royal House (Casa Real), The Alhambra (La Alhambra) - designated a UNESCO World Heritage Site, City of Granada, Province of Granada, Andalusia (Andalucia), Spain, Europe. Casa Real - the Royal House at the Alhambra, Granada.